I have created my application with the height and width given in pixels for a Pantech device whose resolution is 480x800. I need to convert height and width for a G1 device. I thought converting it into dp will solve the problem and provide same solution for both devices. Is there any easy way to convert pixels to dp? Any suggestions? * This method converts dp unit to equivalent pixels, depending on device density. * This method converts device specific pixels to density independent pixels. Use this online converter to play around with dpi values. EDIT: It seems there is no 1:1 relationship between dpi bucket and density. It looks like the Nexus 5X being xxhdpi has a density value of 2.625 (instead of 3). 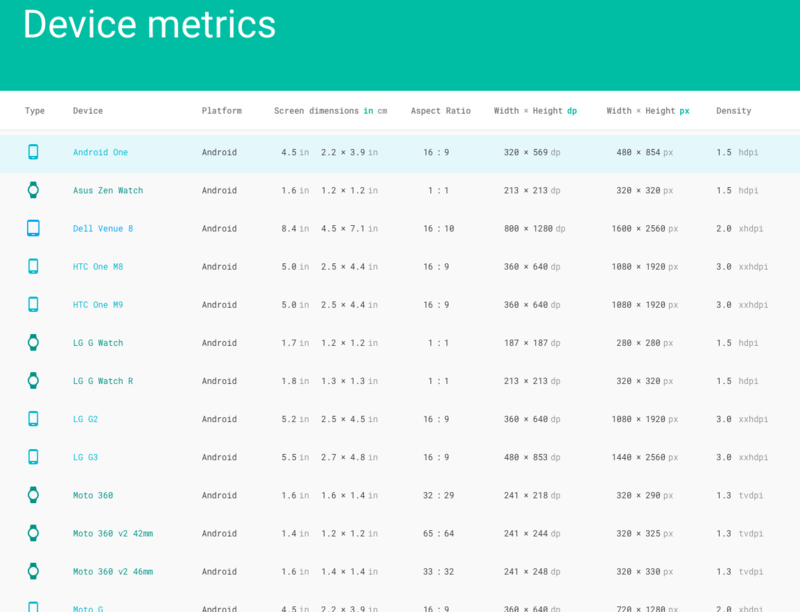 See for yourself in the Device Metrics. If you can use the dimensions XML it's very simple! If you're on a 240dpi device this ratio is 1.5 (like stated before), so this means that a 60px icon equals 40dp in the application. As @Stan mentioned .. using this approach may cause issue if system changes density. So be aware of that! Personally I am using Context to do that. Probably the best way if you have the dimension inside values/dimen is to get the dimension directly from getDimension() method, it will return you the dimension already converted into pixel value. will return the dimension already converted to pixel AS A FLOAT. will return the same but truncated to int, so AS AN INTEGER. To convert dp to pixel. To convert pixel to dp. // Suppress default constructor for noninstantiability. to convert Pixels to dp use the TypedValue . As the documentation mentioned : Container for a dynamically typed data value . You can do the same for the width. You should use dp just as you would pixels. That's all they are; display independent pixels. Use the same numbers you would on a medium density screen, and the size will be magically correct on a high density screen. However, it sounds like what you need is the fill_parent option in your layout design. Use fill_parent when you want your view or control to expand to all the remaining size in the parent container. PX and DP are different but similar. DP is the resolution when you only factor the physical size of the screen. When you use DP it will scale your layout to other similar sized screens with different pixel densities. Occasionally you actually want pixels though, and when you deal with dimensions in code you are always dealing with real pixels, unless you convert them. So on a android device, normal sized hdpi screen, 800x480 is 533x320 in DP (I believe). To convert DP into pixels /1.5, to convert back *1.5. This is only for the one screen size and dpi, it would change depending on design. Our artists give me pixels though and I convert to DP with the above 1.5 equation. If you want Integer values then using Math.round() will round the float to the nearest integer. Not the answer you're looking for? Browse other questions tagged android pixel resolution dpi or ask your own question. How do you display code snippets in MS Word preserving format and syntax highlighting? Set ImageView width and height programmatically? How to retrieve the dimensions of a view? Change the Right Margin of a View Programmatically? What is the simplest and most robust way to get the user's current location on Android? Can the Android Layout folder contain subfolders? How to determine the screen width in terms of dp or dip at runtime in Android?